Tanning beds in pregnancy are unlikely to harm the fetus but may damage your skin. There is no sufficient scientific medical evidence that tanning beds in pregnancy can cause harm to the fetus and they are unlikely to penetrate deep into the skin. But it is known that the ultraviolet radiation emitted from tanning beds is just as damaging to your skin as the sun. Ultraviolet radiation has been linked to skin cancer. And because the skin in areas can become stretched, there is a greater chance of damage. Melanoma (skin cancer) could possibly spread to the placenta, which could be deadly for mother and baby. 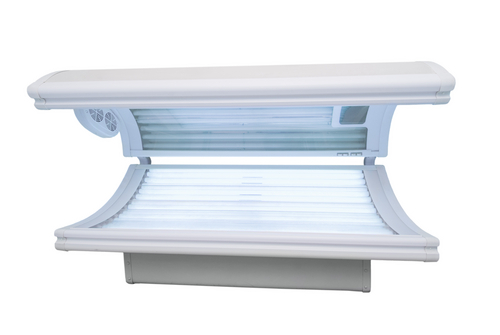 Also tanning beds can accelerate the aging process, causing the skin to look wrinkled and leathery. UV exposure can also aggravate chloasma, dark splotches on the face and sometimes the arms. If exposure is for any length of time the skin could burn. During pregnancy the skin could become more sensitive and the burn could become quite serious, which can also increase the chances of cancer. Other potential risks could be increased core temperature, resulting in possible fetal birth defects. Increased core temperature could lead to dehydration possibly causing pre-mature contractions. Another concern is the length of time lying on the back which could make a pregnant woman feel uncomfortable. Most mothers-to-be say that the risks are just to great to take the chance on a glowing tan. If they choose to be tan, a majority of pregnant women are opting for self-tanning products. These products have come a long way from the orange stain of several years ago. If you feel it is necessary to utilize a tanning bed, it is wise to consult a physician before doing so.